Preheat oven to 350 degrees. 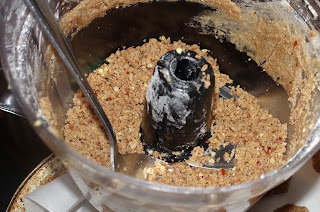 Mixed spelt flour, grapeseed oil, sea salt, medjool dates and walnuts in a food processor. Blend it until a crumbly mixture is formed. While the pie is baking put your peaches, allspice, and date sugar into a pan and cook for 2-3 minutes while constantly stirring.set to the side. After you take the pie crust out of the oven put your peach mixture into the crust first. Then add a handful of walnuts on top. ENJOY!